I didn't post this before I took off to Atlanta, so before I fly back, here goes! 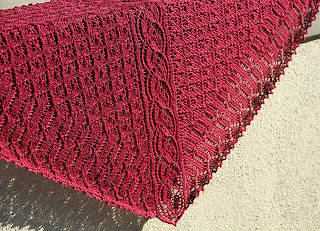 Noliegirl on Ravelry has won my monthly give-away (at the end of September) for her gorgeous Meadowberry (my pattern Meadowgold). Isn't her version lovely? I think the color is stunning! Congrats to you! Just PM me and let me know what pattern you would like!